Advanced eDiscovery requires an Office 365 E3 with the Advanced Compliance add-on or an E5 subscription for your organization. If you don't have that plan and want to try Advanced eDiscovery, you can sign up for a trial of Office 365 Enterprise E5. This topic describes how to run reports in Advanced eDiscovery. You can download a .csv file with a report for the selected process. In the Reports tab, select an option from the Report name list. 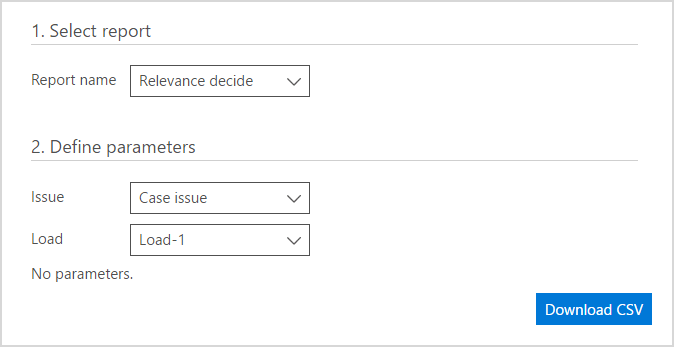 Select from three Report name options: Relevance decide, Themes list, or Tagged files. Available parameters, and sort and filter options can be set, depending on the selected report. Click Download CSV. The requested report is generated and downloaded.